There are a number of Crusader castles in Lebanon, remnants of the many battles fought between Christian and Muslim armies in the 12th and 13th centuries. One of the most interesting – though perhaps least well preserved – is Beaufort Castle. 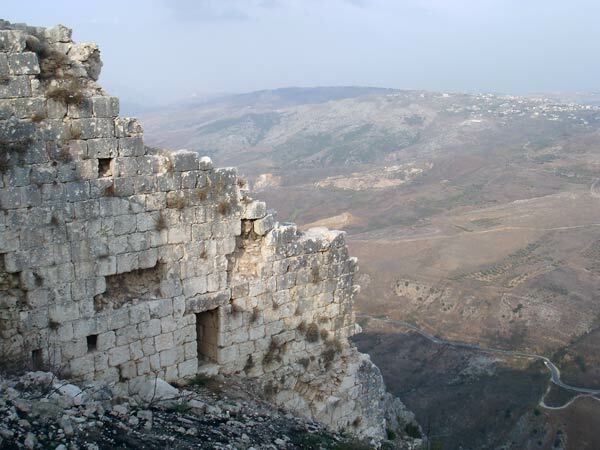 Located 1000 metres above the Litani river and with a commanding view to the south and west, Beaufort has been the castle to possess in Lebanon. During the past 800 years it changed hands several times between the Christian and Muslim forces. Even as recently as the civil war in the 1970s and 1980s, Beaufort was initially held by the PLO and then by the Israeli Defence Force. And no wonder: looking to the south you can see into Israel and up to the disputed Golan Heights. This map shows its strategic location. Unfortunately, through all of these battles the castle has been severely damaged. Most recently, the departing Israeli forces blew up their fortifications at the site, damaging other parts of the castle in the process. Bottom left picture looks like a dunny with a distress flag (run out of paper?). I’ll send comparison picture for you to insert if you wish so that you and other blog readers can see what I mean. Can’t say I’d want to spend too much time up there even if it does have a great view; now if they put in a cresta run a la Jambaroo Bourke would be in 7th heaven. Hi, after reading this awesome piece of writing i am as well delighted to share my knowledge here with mates.